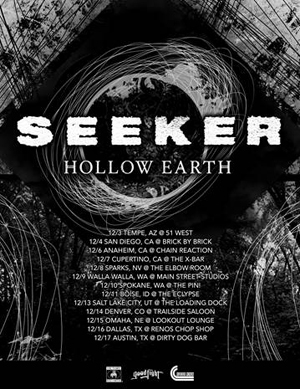 With the release of their new album Loss last week, SEEKER has revealed their headlining December tour plans. Proving to be a breakthrough for the Texas trio, Loss is currently being performed in its entirety as SEEKER’s current tour rolls through America with THE LAST TEN SECONDS OF LIFE, TRAITORS and SPITE. The October/November trek includes festival stops at So What?! in Dallas and Texas Revolution in Austin, and new December headlining dates can be found below. Support on these dates will come from HOLLOW EARTH. SEEKER recently released two videos from the album, “Void” and title-track “Loss”.